Those of you who have been with this series since the release of The Diviners understand a little something about waiting. We've been waiting for Lair of Dreams for years. Many times we would check Amazon for the release date, get excited, and become disappointed when it was inevitably pushed back by months (okay, three times by my count). But we waited, because we knew Libba Bray would make our wait worthwhile. And how. It's a little difficult to summarize this monster of a book (it's over 600 pages and bigger than most bookends), but here we go: The sleeping sickness hinted at in The Diviners has started to take over the city, and no one knows where it's coming from or how to cure it, not even the Diviners. Henry, a sleepwalker, meets Ling, a girl from Chinatown with the impressive ability to commune with the dead through her dreams. They're searching for different things, but they team up to explore the magical, dangerous dream world. Meanwhile, Evie has risen to stardom, but she's more self-destructive than ever. When a little lie puts her in cahoots with Sam, she finds herself venturing back into the darker corners of the Diviner world and none too happy about it. Meanwhile, Jericho is doing all he can to save the Museum of the Creepy Crawlies while Will is on a research trip, and trying not to think about Evie. And things are going great between Theta and Memphis, except...Theta is still keeping secrets and Memphis is struggling to deal with the return of his own abilities. There's a lot going on in this book, but Henry and Ling's exploration of the dreamworld and their developing friendship takes center stage. Bray skillfully sets up a sinister force, giving the sleeping sickness a persona and dark desires that are near impossible to break free from, and its origins are tangled with the history of New York City and Diviner lore. 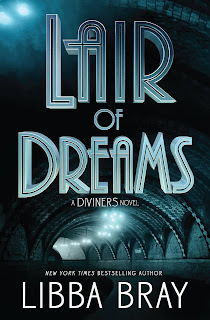 And let's talk about Diviner lore for a moment: Bray does a brilliant job at weaving in the history of Diviners with American mysticism and other folklore around the world. (Guys. There's even a Gemma Doyle cameo!) Not only does it make the magic of this book that much more authentic, but it makes the history and culture of the 1920's just pop off the page. This book is so meticulously researched; the historical details aren't just interesting signposts, but essential to the heart of the story. The balancing of the characters and the action is impressive, and I think it does flow more quickly and smoothly in this installment than it did in The Diviners. Like The Diviners, Lair of Dreams does offer a full arc, with a mystery, conflict, and resolution, but it does reveal a little more about the larger mystery of why the Diviners are important and what exactly is happening in their world, with very few answered questions. Which means that we are in for another long wait. I don't mind. I'll likely be in my thirties before this series is finished. I know it'll be worth it. I've just picked up the Diviners and am loving it. I agree about how Bray weaves the history and paranormal. Love her writing. Glad to hear the series continues well.